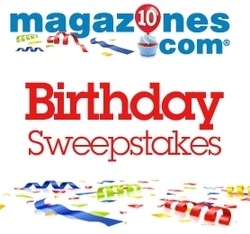 Magazines.com, the oldest and largest magazine subscription agent on the Internet, is celebrating 10 years of business with the Birthday Celebration Sweepstakes. It’s Magazines.com birthday and we’ll give away prizes if we want to! To mark the incredible milestone of 10 years in business, Magazines.com is celebrating with the Birthday Celebration Sweepstakes, starting today. Magazines.com will give away one Dell Laptop Studio 15 computer; one Garmin Nuvi 1690, 10 Flip Mino HD video cameras and 100 $10 Magazines.com gift cards. The Birthday Celebration Sweepstakes is open to U.S. residents age 18 and older. Participants may enter one time each day through January 22. Winners will be selected at random and announced on or around January 29, 2010. For more information and to enter the sweepstakes visit our official sweepstakes entry page. When it comes to celebrating Magazines.com’s 10th birthday, everyone is invited to join in the celebrating!